The history of Aviation Industry in India traces back to 1911 when the first commercial flight took off from the grounds of Allahabad for over a distance of six miles. This specific event changed the complete history of the civil aviation industry in the country. Now, India is the third largest civil aviation market in the world with a record of 100 million passengers travelling every year. A study claims that the aviation is the fastest growing Industry to offer a plethora of job opportunities to meet the increasing demand. The industry has estimated that the sector can provide with more than 4 million job opportunities by 2035. With many private aviation institutes in India, it is important to ensure that these institutes have adequate faculty, relevant curriculum, well-designed laboratories and research facilities. We at Higher Education Review are trying to ease the selection of best aviation institute as we have come up with a list which is prepared on the basis of quality and ranking. 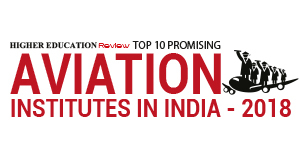 In our issue 'Top 10 Promising Aviation Training Institutes in India - 2018', we have identified top institutes in aviation, which are not only providing students with a comprehensive education, but also focusing on intensifying placement prospects. Inspire Academy Mumbai, Maharashtra With highly experienced faculties who are aviation experts, the institute offers well researched and flexible courses that help aspirants be industry ready professionals. International Institute of Aviation Bangalore, Karnataka With a unique curriculum, pedagogy and innovative programs, the institute charts a unique and high growth path not only in aviation, but also in hospitality, travel management and customer service industry. Jettwings Guwahati, Assam One of the most sought after training institutes by the recruiters and trainees, the academy focuses in quality training and placements into niche segment of Hospitality, Travel and service sector. Orient Flights Civil Aviation Academy	 Mysore, Karnataka Having one of the best fleet of training aircrafts, the academy trains its student pilots with the latest achievement in technology and safety. World Wide Aviation Dwarka, Delhi Certified by the International Organization to provide professional aviation, the institute is specialized in profeesiona and private flight programs.